SEO – How Long Does it Take? 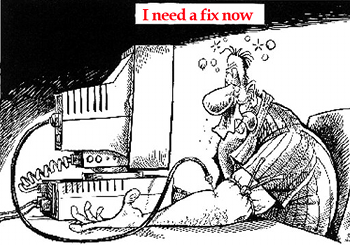 I have a confession – SEO addicts are out to score their next fix NOW. They’re all strung out from years of suffering the withdrawal of finding new traffic and customers. Believe me, if there was a 12 step program for them, I would be referring hundreds of new members to the closest meeting. Can you afford our $4k set up fee? Now for the honest answer. This is based on more than five years of working with clients. Some had no SEO traffic or ranks when we started together. Others had 1000- 8000 visitors a day but a mere 2.94% of their traffic was from organic rankings. I know right, what’s the problem? With that kind of traffic who cares? Actually the 8000 folks should have been seeing more like 30k a day if they had set up their SEO content correctly. Google LOVES optimized, honest SEO. But they go bonkers over updated sites with fresh, original content. If you’ve made it this far, what I could do is write another 1200 words keeping you hanging on every word. That’s what sooooooo many crappy articles and SEO wannabees do. They hook you into staying committed to the post or page. Then at the end (which is pretty sleazy) they reveal their SEO secret. It’s usually a lame sentence or two about optimization and backlinks. Duh! Who doesn’t know those two off-the-cuff dorky insider secrets. Truthfully, here’s my shortlist of SEO winners and losers since 2007… One month: yuppers. This was back in 2010. Those were the days when all you needed was an exact matching domain for your target keyword. It was a real estate client who was gutting it out with the thousand realtors. Her market was all of Maine. After some keyword research and time on Godaddy, I snagged the domain mainelistings.net. Don’t bother going there. It’s a dead domain now. That’s the thing about SEO. Everyone starts and then abandons great ideas. The only reason? Impatience. But in her case, the keyword phrase ‘maine listings’ was seeing more than 5000 exact searches a month in the U.S. With those kind of numbers it was a slam dunk project. So we built a WordPress site using the domain. With optimized content, plenty of text and video we hit #22 in about two weeks. From there it was merely adjusting her keyword densities and piling on more original text content. But remember, this was before Google took away SEO ranking juice for exact match domains. By the fall of 2012 EMD trickery was hardly worth the effort. You can still find them from time-to-time. But simply scooping up one won’t catapult you to page one using this old SEO trick. Bummer, I know. I know what you’re thinking. What magical, sneaky little thing did we do in his SEO to rock his ranks? You wouldn’t believe me if I told you. But since I’m sticking with my story here how long it takes to see some industrial-strength SEO really work, I’ll spill my guts. In Joe’s case, his site was a freak show back in 2010. So for Joe, we added new SEO content about three times a week. It was peppered with video. Then we monitored his rankings daily. When we noticed SEO trends, we did what any dope should do. Capitalize on the trend by adding more content. Two months: okay, before you go rubbing your hands together excited about all the money you’ll be making take a deep breath. I’ve had a few clients that cranked out positions on Google in eight weeks. But it didn’t involve link schemes or smoke and mirror SEO black magic. 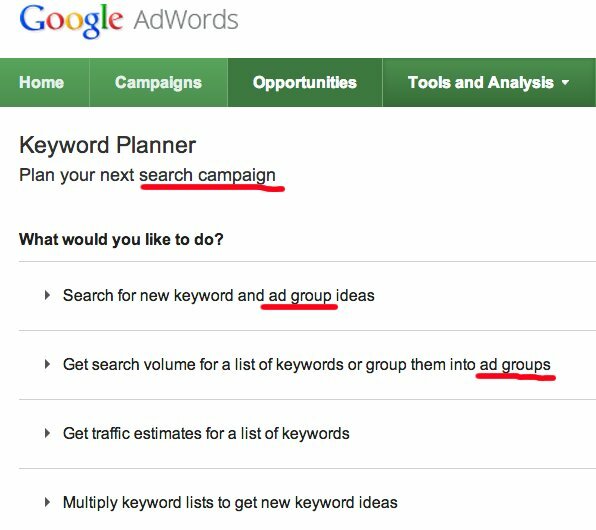 In the fall of 2013, Google’s free AdWord keyword tool changed. 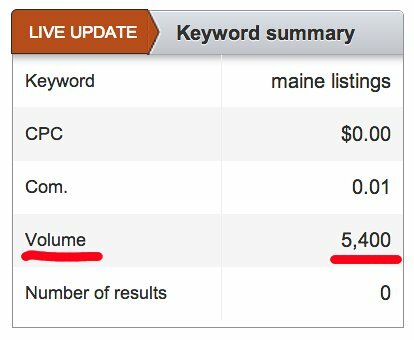 No longer can you easily pull organic keywords with search counts. Now the tool is designed purely to build ad groups to spend money on PPC. Ouch, I know. The one free tool SEO geeks were using for 14 years no longer provides the rich keyword research for organic search. Sure there’s some but not nearly the lists this once beloved SEO tool did forever. Notice the graphic above mentions ‘ad groups.’ That translates into spending money in PPC. Bad idea. The ROI is pitiful because if you don’t capture your click throughs into your CRM, then that money is long gone. Organic SEO ROI is a far safer investment over the long haul. So now what? Well, we use two different tools. They’re paid services that dig very deep into keyword trends being searched every day globally. We can also scale our search by country and competition. Doing so allows my team to develop a keyword list that’s more practical to rank for using our propriety content management technique. You have a choice. Be a big fish in the ocean. Or a monster whale in a small pond. What’s your only option in the beginning? Go small my friend. It’s the very best way to capture rankings early on while optimizing for the bigger searched keywords. There’s more good SEO news. If you find the correct organic SEO keywords, things can really cruise without having to rely on spending money in PPC. Seven months: did you know if you spend about 80% of your time evaluating your competition you’ll waste 80% of your time? Everyone loves to spy on their competition’s SEO. They think they’ll glean some insider information how to overtake their competitors. Guess what? It’s a big, fat SEO waste of time. If you’re tired of getting SEO advice from freaks, your third cousin who dabbles with computers or SEO firms that want to jack you out of your money, take some time to think about what’s important to you in the next few years. Is it fast ranks? If so, forget it. SEO no longer works that way. If you can adjust your expectations toward building something over a year or two your SEO will develop. Learn more about our SEO methodology.